It took me a long time to actualize Virginia Woolf's advice. The room - my room - has a desk. The desk has drawers. One drawer contains the box of staples which (thanks to the wit and wisdom of James Collins) reminds me of my mortality. I love his “staples” story - “Let Me Count the Days”. Pause now to read it, or promise you’ll come back for guaranteed reading pleasure. Like mine, his drawer features a box of Swingline staples. With droll insight, he outlines his calculations - a distraction fueled perhaps by writer's block or simple procrastination? I'll offer a summary - 4850 staples, divided by 15 used per year, equals 323 years! He realizes he will not use them up in his lifetime, and admits to similar problems with the books he has accumulated and possibly even pickles. He concludes - "Staples, books, pickles …. When do you realize that you are going to die? When you realize that, in the remainder of your life, everything is countable." Not cheerful, but then the message is - make each day count! 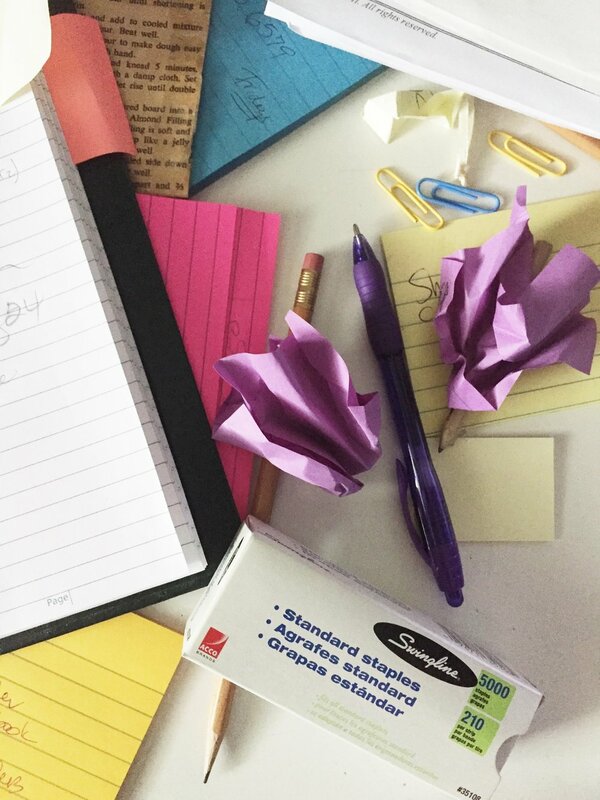 Like Collins, I have several “too manys” – too many staples, pencils, stickie note pads… and… wait for it… too many recipes! Even if I live another couple of decades, I could make a new recipe every single day and never exhaust the collection. 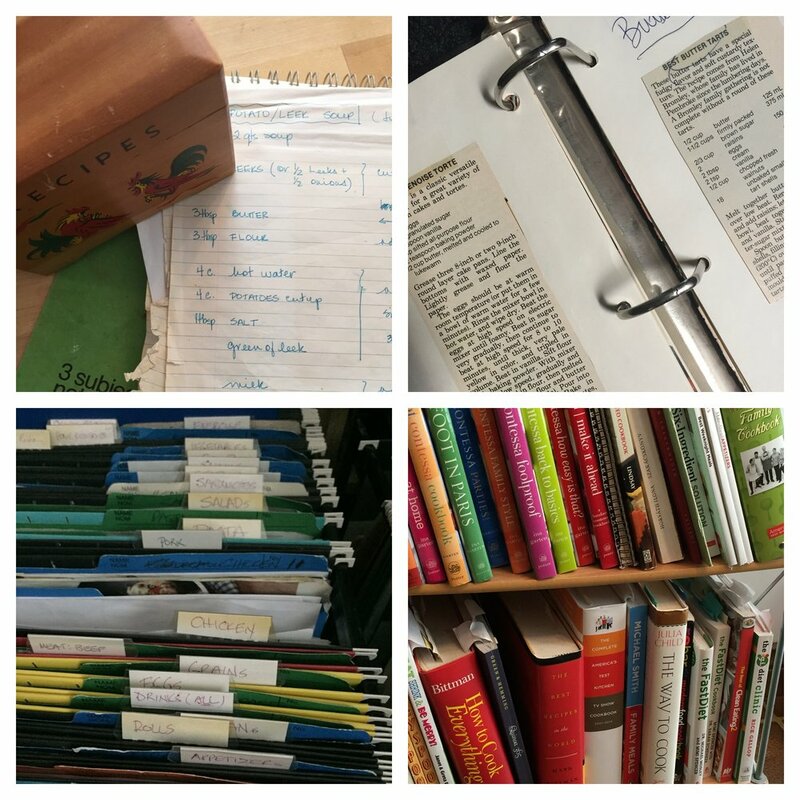 In the last five decades I progressed from the wee recipe box, followed by the green notebook, the black binder, and the hanging folders. This does not include the cookbooks and “keeper” magazines. I lost in the work / life balance game and “a well-ordered house” was a casualty. I swore that I’d spend my first year of retirement cleaning house, but I have not yet impressively applied myself to that task. Shuffling the contents of drawers, I have stumbled across “to do” lists (literally from the last century) - “organize photos” (not done…), “organize recipes” (getting there… ). Ultimately, the recipes I really, really want to keep and use (and pass along to next generations) will have to make it to the blog. Ah, my blog – IMHO a serenely organized digital collection. But the outcome masks the journey, and I am betting there is not a food blogger out there who is not surrounded by scattered piles of notes and recipes and books, and perhaps even a BuJo (aka a Bullet Journal – yup, that’s a thing). Chaos. Chaos and clutter – the enemy of KonMari devotees. But does chaos / disorder have any redeeming qualities? On a bad clutter day, let that be a mantra. On the other hand, I will not deny that there are parts of my mind that long for order, for release from the burden of "stuff", and for the tranquility of minimalism - and not because it is a trend. I did not experience "The Great Depression", but grew up in an immigrant household. Maybe that accounts in part for why I often hang on to some things, thinking maybe one day there will be a catastrophe or scarcity and I will need it! Bringing order to my recipes will remain a quest. I am, after all, a bit of a “quest girl” – always hunting for some ingredient, some recipe that will replicate a food memory. Fitting that I should end this blog post by sharing a successful quest – my hunt for “Portuguese Buns” which in fact turned out to be “Portuguese Muffins” (Bolo Levedo). Now that’s a story – and a taste sensation. Click here for the recipe. Postscript - a therapeutic read for those feeling bad about cluttered / "homey" houses. Click on the word "Comments", below, to ask questions or share tips. Would love to hear about your chaos, creativity thoughts. If you enjoyed this read, please take a second to click on "Like"!